Karnataka government on Saturday moved the Supreme court seeking a review of its order directing the state to release Cauvery water to Tamil Nadu even as it faced strident calls from opposition parties not to release the water "at any cost". The Karnataka government filed a review petition in the apex court against its three recent orders on Cauvery water release to Tamil Nadu and direction for constitution of Cauvery Water Management Board by Centre saying it would cause "undue hardship" to the state. In the petition, it said that "grave miscarriage of justice" has been caused to it pursuant to three orders of the Apex court dated September 20, 27 and September 30, by which it directed the state to release 6,000 cusecs of water till October 6 and constitution of board by Centre till October 4. It said that apex court has "committed an error" in directing the Centre to constitute Cauvery Management Board, without considering the fact that three judges of apex court has held in 2013 that direction to constitute the board "can wait and may be heard along with the Civil Appeal". exercising the power as well as the nature of the function and obligation arising from the Legislation", it said in the review plea. The plea moved by Karnataka said further water release orders from the reservoirs of Karnataka would "cause irreparable injury" to Karnataka as once the release are made from the reservoirs of the state, the water cannot be retrieved in case of good normal North-East monsoon. The Apex court had on Friday taken Karnataka to task for its repeated "defiance" by flouting its orders for release of Cauvery water to Tamil Nadu and had directed it to discharge 6,000 cusecs water from Saturday till October 6. It had warned Karnataka that no one would know when the "wrath of the law" would fall on it. Emerging out of a more than a three-hour long all-party meeting in Bengaluru, BJP and JDS leaders said they told the government to stick to the resolution passed by both the Houses of state legislature on September 23 that water should be used only for drinking purpose, and not be spared for any other use. The opposition parties also asked the Siddaramaiah government to oppose the formation of the Cauvery Water Management Board. "We should not obey the Supreme Court order at any cost as it is unimplementable. The House (legislature) decision should be upheld. Government should stick to the decision," Opposition BJP leader in the Assembly Jagadish Shettar told reporters in Bengaluru. JDS leader Y S V Datta said the state should not release 6,000 cusecs of water as directed by the apex court "at any cost". "Whatever may be the consequences, we will all face it together. We are with the government," he said. Meanwhile, former Prime Minister and JDS supremo H D Deve Gowda began an "indefinite" fast seeking "justice" for Karnataka in the ongoing row with Tamil Nadu. The 83-year-old Janata Dal (Secular) supremo is sitting on fast near the Mahatma Gandhi statue next to Vidhana Soudha, the state secretariat, saying, "We want justice. Drinking water is essential for humans to survive." Asserting that he would continue his protest till Karnataka gets justice from the Union government, Gowda said he still has "confidence" in the Prime Minister that the issue will be resolved. Home Minister G Parameshwara, who visited Gowda, said the former prime minister had always fought for the state's interests and added, "I hope it (the hunger strike) will open the eyes of the judiciary." Union Ministers D V Sadananda Gowda and Ramesh Jigajinagi and former Chief Ministers B S Yeddyurappa (BJP) and Shettar, JDS leader H D Kumaraswamy and Congress leader in Lok Sabha Mallikarjun Kharge were among those who attended the meet. An attempt to broker an agreement between the two squabbling states by the Centre on September 29 had failed to yield any result. The Cauvery Supervisory Committee had on September 19 asked Karnataka to release 3,000 cusecs daily from September 21 to 30, but the apex court the next day doubled the quantum to 6,000 cusecs from September 21 to 27 after Tamil Nadu pressed for water to save its samba paddy crop. On September 27, the Supreme Court bench directed Karnataka to release 6,000 cusecs water to Tamil Nadu for three days, despite the resolution of the state legislature. In between on September 12, the court had modified its order of September 5 directing Karnataka to release 12,000 cusecs per day till September 20 to Tamil Nadu. 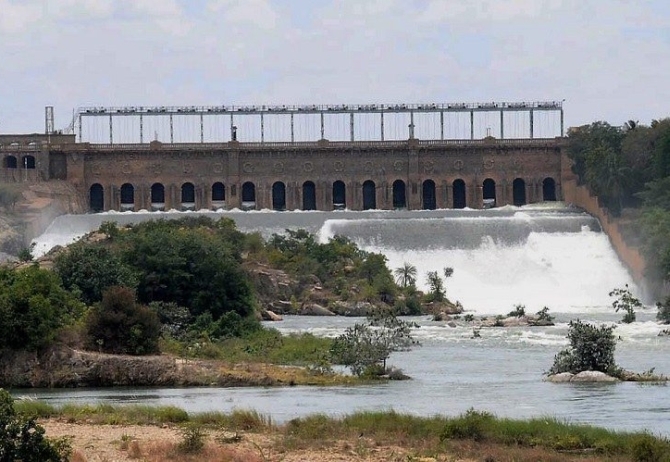 The September 5 order had directed release of 15,000 cusecs of Cauvery water per day to Tamil Nadu for the next 10 days. In an unprecedented move in the more than century-long Cauvery dispute, both the Legislative Assembly and the Council on September 23 had adopted the resolution not to provide water for any other purpose except to meet drinking needs, citing "acute distress" and "alarmingly low levels" in its dams.